Preheat oven to 375°. Reserve 3 tablespoons cherries for topping. For filling, beat cream cheese, sugar and extract until smooth. Stir in 3/4 cup pecans and remaining cherries. On a lightly floured surface, unroll crescent dough into one long rectangle; press perforations to seal. Fold dough lengthwise in half; roll into an 18×12-in. rectangle. Spread filling over top to within 1 in. of edges. Roll up tightly jelly-roll style, starting with a long side; pinch seam to seal. Transfer to a greased baking sheet, seam side down; shape into a ring, pinching ends to seal. Using kitchen scissors, start at outside edge and cut two-thirds of the way through the ring at 1-in. intervals. Separate sections slightly and twist to show filling. Bake at 400° for 20-25 minutes or until golden brown. Remove from pan to a wire rack to cool. 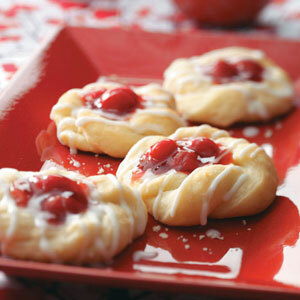 In a small bowl, combine confectioners’ sugar and enough milk to achieve desired consistency; drizzle over tea ring. Yield: 1 ring (24 slices). Place flour in a mixer bowl; beat in 1/4 cup oil (mixture will be slightly crumbly). In a small bowl, slowly whisk warm water into beaten egg; add to flour mixture, mixing well. Beat in remaining oil until smooth. Transfer to a greased bowl, turning once to grease the top. Cover with plastic wrap and let rest in a warm place, about 30 minutes. Preheat oven to 350°. Spread bread crumbs into an ungreased 15x10x1-in. baking pan. Bake 10-15 minutes or until golden brown, stirring occasionally. Cool completely. Tape a 30×15-in. sheet of parchment paper onto a work surface; dust lightly with flour. 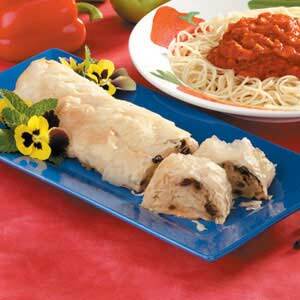 Divide dough in half; place one portion on parchment and roll to a very thin 24×15-in. rectangle. (Keep remaining dough covered.) Remove tape from parchment. Sprinkle 3/4 cup bread crumbs over rectangle to within 1 in. of edges. Starting 3 in. from a short side, sprinkle 3 cups apples and 1/4 cup raisins over a 3-in.-wide section of dough. Mix sugar and cinnamon; sprinkle half of the mixture over fruit. Drizzle with half of the melted butter. Roll up jelly-roll style, starting at fruit-covered end and lifting with parchment; fold in sides of dough as you roll to contain filling. Using parchment, transfer strudel to a 15x10x1-in. baking pan; trim parchment to fit pan. Bake on lowest oven rack 45-55 minutes or until golden brown, brushing top with sour cream two times while baking. Repeat with remaining ingredients. Using parchment paper, transfer to a wire rack to cool. Serve warm or at room temperature. Yield: 2 strudels (8 slices each). Editor’s Note: To make fresh bread crumbs, tear bread into pieces and place in a food processor; pulse until fine crumbs form. Two to three bread slices will yield 1-1/2 cups crumbs. In a small bowl, dissolve yeast in warm milk. In a large bowl, combine flour, sugar and salt. Cut in butter until crumbly. Add yeast mixture, cream and egg yolks; stir until mixture forms a soft dough (dough will be sticky). Punch down dough. Turn onto a lightly floured surface; divide into four portions. Roll each portion into an 18×4-in. rectangle; cut into 4×1-in. strips. For icing, in a bowl, beat confectioners’ sugar, butter, vanilla, salt and enough cream to reach desired consistency. Drizzle over Danish. Yield: 3 dozen. In a large bowl, combine the contents of the roll mix and yeast packets with the sugar. Stir in water, butter, egg and maple flavoring; mix well. Turn onto a floured surface; knead until smooth and elastic, about 2-3 minutes. Place in a greased bowl, turning once to grease top. Cover bowl with plastic wrap and let rise in a warm place until doubled, about 45-60 minutes. In a small bowl, combine sugar, walnuts, cinnamon and maple flavoring. Grease a 12-in. pizza pan. Punch dough down. Turn onto a lightly floured surface; divide into three portions. Roll each into a 12-in. circle. Place one circle on prepared pan. Brush with a third of the melted butter; sprinkle with a third of the filling. Repeat layers twice. Pinch around edge to seal. Place a small glass in center of circle. With kitchen scissors, cut from outside edge just to the glass, forming 16 wedges. Twist each wedge five or six times and tuck ends under. Remove glass. Cover with a kitchen towel; let rise in a warm place until doubled, about 30-45 minutes. Preheat oven to 375°. Bake 20-25 minutes or until golden brown. Remove from pan to a wire rack to cool. Combine glaze ingredients; drizzle over warm coffee cake. Yield: 16 servings. Preheat oven to 400°. In a large saucepan, bring water, butter and salt to a boil. Add flour all at once and stir until a smooth ball forms. Remove from heat; let stand 5 minutes. Add eggs, one at a time, beating well after each addition. Continue beating until mixture is smooth and shiny. 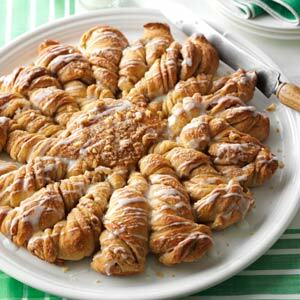 Using a tablespoon or a pastry tube with a No. 10 or large tip, form dough into 4×1-1/2-in. strips on a greased baking sheet. Bake 35-40 minutes or until puffed and golden. Remove to a wire rack. Immediately split eclairs open; remove tops and set aside. Discard soft dough from inside. Cool eclairs. In a large bowl, beat milk and pudding mix according to package directions. In another bowl, whip cream until soft peaks form. Beat in sugar and vanilla; fold into pudding. 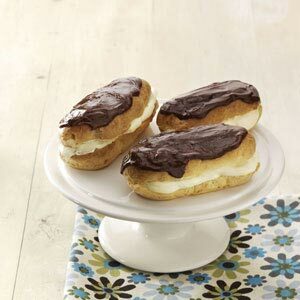 Fill eclairs (chill any remaining filling for another use). For frosting, in a microwave, melt chocolate and butter; stir until smooth. Stir in sugar and enough hot water to achieve a smooth consistency. Cool slightly. Frost eclairs. Store in refrigerator. Yield: 9 servings. In a microwave-save bowl, combine the raisins, water and almond extract. Microwave, uncovered, on high for 1-1/2 minutes, let stand for 5 minutes. Drain. Add the apples, 1/3 cup sugar, flour and cinnamon; toss to coat. Set aside. Place 1 sheet of phyllo dough on a work surface. Combine butter and oil; set aside 2 teaspoons. Lightly brush some of the remaining butter mixture over phyllo dough. Keep remaining phyllo dough covered with plastic wrap and a damp towel to avoid drying out. Layer with 7 more sheets of phyllo, brushing each layer with some of the butter mixture. Spread apple mixture over phyllo to within 2 in. of one long side. Fold the short edges over filling. Roll up jelly-roll style, starting from the long side where the apple filling is 2 in. from edge. Place seam side down on a baking sheet coated with cooking spray. With a sharp knife, cut diagonal slits into top of strudel. Brush with reserved butter mixture. Sprinkle with remaining sugar. Bake at 350° for 35-40 minutes or until golden. Yield: 4 servings.